Challenger Deep is Dave Manington’s third album as a bandleader and the second from his Riff Raff sextet. The line-up has remained remarkably stable and perhaps this is a key element in the consistently high-quality music heard on this Loop Collective album. All six musicians are busy in other bands, touring and recording yet make time to sustain Riff Raff’s creative momentum. Nine tracks across seventy plus generous minutes comprise Brigitte Beraha’s lyrics on four tunes and her horn-like, wordless vocals on several others. Manington infuses his CD liner notes with gentle humour, poking fun at Tom Challenger in thinking the album was named after him! As one should know Challenger Deep is the deepest ocean trench in the world and Manington expresses wonderment as to what exactly is living down there 11km below the surface. The title track makes one think that drummer Tim Giles has been down there such are the convincing knocking sounds the submariner would expect to make or, spookily, hear on the exterior of a submersible. Beraha’s light, floating vocals complement, respond to and ignite Tom Challenger’s sinewy tenor lines; similarly on Random Acts of Kindness wordless vocals swirl and swoop, capture, then free guitarist Rob Updegraff to create his own stunning, fluent lines until Beraha turns her attention to Challenger’s tenor once more, voices in unison. From time to time the sextet works up a head of steam. The elegance remains intact but when the gloves are off (the band name – Riff Raff – tells you all you need to know about these ruffians) the change of gear is quite exhilarating; Prime Numbers and Dangerpig are the two tracks on the CD which best illustrate their collective inclination to dive into uncharted depths and survive to tell the tale. The penultimate track – Thagomizer…ask your kids, it’s to do with dinosaurs – involves free, or freeish sections, more so than Manington’s eight other compositions. Willow Tree closes a fine album which reveals hidden depths the more one listens to it. 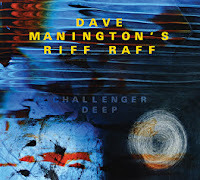 Challenger Deep by Dave Manington’s Riff Raff is released on the Loop Collective label (cat no. 1030) on May 11 with an album launch gig at London’s Vortex on May 12.